Ashem Crafts manufacture the genuine Fred Lambert rounders which have taken many years of research and development to perfect. The Rotary planes are used mainly in chairmaking but the scope for their use is very wide and varied - wherever lengths of round wood are needed, the rounders are ideal for this purpose. Each required diameter of wood coming from the tools is of dependable accuracy and has a good smooth finish, especially when hardwoods are used. Rounders produce cylindrical lengths of wood in various diameters according to the size of tool being used (see price list for range of sizes available).With the rounders, joints for chair parts and the chair parts themselves can be quickly and easily made. Most rounders have a (3/8)" reduction between the entry size and the emerging finished diameter. 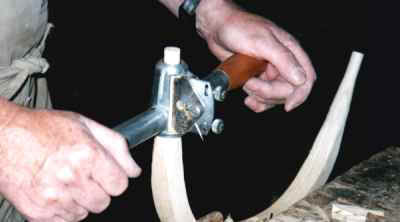 The rounders can be rotated by hand on wood held securely in a vice. Alternatively, for those craftsmen who possess a standard wood-turning lathe, this can be used very successfully with the smaller rounders if the speeds can be reduced to approximately 400 rpm. Larger rounders require slower speeds if mechanical rotation is to be used. By far the best method of rotating the wood is by means of our own turning-head which has been designed specifically and purpose built for use with the rotary planes. The turning-head rotates in both directions on four speeds ranging from approximately 60-450 rpm. 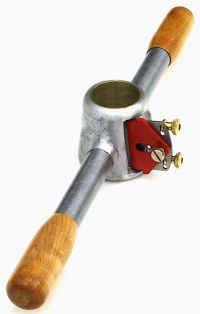 A standard wood turning lathe with a variable speed motor can be used to rotate the wood. 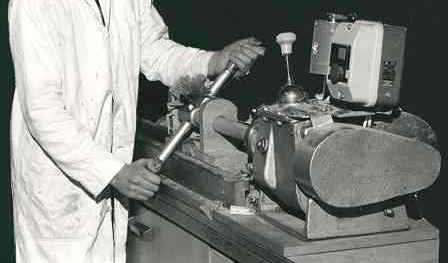 If such a machine is to be used then a wooden steady should be secured to the lathe bedways to prevent whiplash as the wood is being rotated. For an illustration of this method see Mike Darlow's book "Wood Turning methods" (ISBN 0-85442-086-X apges 77 & 78). Alternatively, should you be amongst that small band of purist craftsmen who do not wish to become mechanised, you would be able to round down or taper chair parts using our trapping plane in conjunction with the handcrank/twizzler. The rounders are cast in aluminium with brass bushes and solid wooden handles. Standard spokeshave blades are fitted and the tools are sharpened and set before despatch ready for immediate use. An instruction sheet on the preparation of material and re-sharpening of blades is enclosed with every order.